I’ve always been really shy. And by “really shy”, I mean painfully, awkwardly, embarrassingly shy. I was the little girl who hid behind her mom’s skirt whenever anyone spoke to her; I was the one who was too shy to ask any shop assistant for help; I was the one who was too shy to call up and order a pizza on the phone. There isn’t anyone else in my family who is anywhere near as shy as I am (apart from my daughter!) so I have no idea how I developed such an extreme shyness. These days, now that I have my own children, I have to be quite a bit less shy. I have to actually speak to people and put myself in uncomfortable situations at times. It’s been hard for me to manage this over the years, but I like to think I’m doing okay now. I’m sure people still think I’m quiet, awkward, and unable to open up and just say something interesting for once, but I do have my good days. Now that we’ve settled into school for a couple of years now, I have fallen in with a lovely group of moms. They often meet up after school dropoff for a morning coffee, which is just my kind of style. This is a new experience for me, as I haven’t formed such close relationships with other moms. I feel like I rarely have even spoken like an adult since my first child was born, let alone even speak to group of adults gathered around a table in a cafe. I’m very happy when I’m with them and consider myself lucky to have such great company. Yes, I’m still the one that doesn’t talk much and sometimes awkwardly stumbles on what I’m trying to say, but I’m trying to just relax, enjoy where I am and have a good time. Sometimes I’ll take something or other that I’ve baked for the “coffee mums” (as my children call them!) to try out. They tried my rum & tonka bean dark chocolate truffles and some homemade Larabars. Last week, I took some homemade Biscoff spread for them to try. 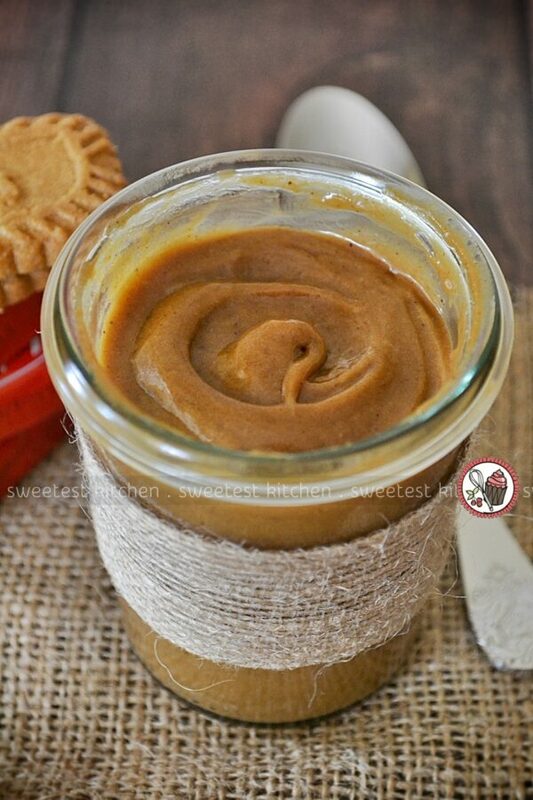 A friend of mine had shown me a recipe to make Biscoff spread at home. Since Biscoff spread has yet to become popular in Australia, I decided this is a recipe I should become familiar with. The recipe is very simple and includes a package of Biscoff biscuits, a little bit of brown sugar, coconut milk, butter (or coconut oil), lemon juice (to brighten the flavor) and a touch of cinnamon. The ingredients are tossed into a blender, and you end up with a delicious, creamy Biscoff spread to use as a fruit dip, or drizzling on ice cream or pancakes, or however you like. So I made the recipe and was quite impressed with the results. It wasn’t exactly the same, of course, but good enough. I felt that the deep caramel flavor of the biscuits were more mellow than I liked, and the taste of the coconut milk came through. So my friend suggested trying evaporated milk instead of the coconut milk. The evaporated milk version seemed to allow more of the biscuit flavor to shine, but I still wasn’t sure which I preferred – the coconut milk one, or the evaporated milk one. And this is where the “coffee mums” came in. I took a jar of each for them to taste test. This was really helpful in determining the winning recipe, despite the results ending with a tie! Two moms agreed that the evaporated milk recipe allowed more of the caramel/gingerbread to come through; one mom loves coconut, so she preferred the taste of the coconut milk one; the other mom just simply preferred the coconut one. When I added my opinion to the results, however, the evaporated milk recipe won. However, if you’re a vegan, or just simply aren’t into dairy, switch out the evaporated milk for the coconut milk and replace the butter with coconut oil. Biscoff biscuits are vegan as well, so consider yourself a very lucky vegan! The spread featured in the photos above was made using coconut milk. 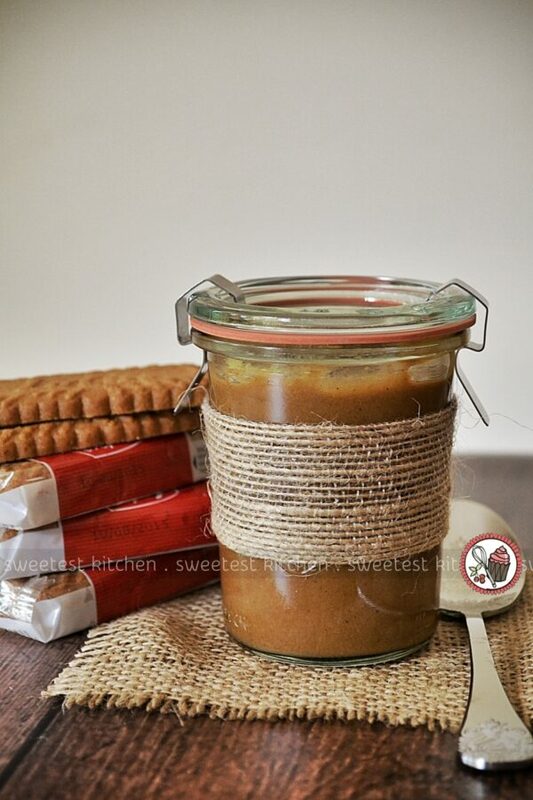 A simple recipe for homemade Biscoff spread. Easily adaptable for vegans. Place biscuits and brown sugar into a blender or food processor. Process just until the biscuits are finely ground. Add evaporated milk and process for about 1 minute. Finally, add butter, lemon juice and cinnamon and process again for about 30 seconds. Store the spread in a clean, airtight jar in the refrigerator for about a week. Use it as a fruit dip, or for drizzling on ice cream, pancakes, or anything you like. Easily make this recipe vegan by switching out the evaporated milk and butter for coconut milk and coconut oil. Having trouble finding Biscoff biscuits, fellow Aussies? Try looking in the biscuit aisle at Coles; they're in a tiny red and white packet and are called Lotus biscuits. They're less than $2 and you get exactly 124g - perfect for this recipe. Hi! As a ‘coffee mom’ I’d like to say how much I enjoy your company and I am so pleased that you have joined us. I definitely think you have lots of interesting things to say. It’s a great way to start the day with a coffee (often not just a quick coffee) with lovely friends isn’t it! Oooh I have just looked at the time. I had better get organised for school pick up – see you there! By the way your blog and your cooking are AWESOME!! We had the Biscoff Spread on ice cream last night. YUM! Your recipe sounds nice, I’m going to try it, can you tell me where you buy the Biscoff biscuits cause i don’t think i have seen them in the supermarket? go to the website and click store locator then click state then scroll down a bit and it should show you. Hi Deborah, it depends on where you live. If you are in Australia, you can find Biscoff at a few online shops. On google, search for “speculoos australia” and you should be able to find some online shops that sell it. Speculoos is Biscoff’s original name, and it is one and the same as Biscoff. If you are in the US, just go to biscoff.com to either buy online or find a shop near you that sells it. The recipe calls for 100g of evaporated milk. The cans here come in mls (375ml). I used this online converter http://www.onlineconversion.com/weight_volume_cooking.htm and it suggests 100g is 94ml. Do you just use 100ml or do you weigh the milk? Also I think I may just make a double batch as a 185ml can would be perfect for this (just under 188mls) with no wastage. Have you tried this and does it work (for some strange reason sometimes halving and doubling doesnt always work, but i guess thats normally when there is actual cooking/baking involved…. so i guess it probably would work and that is a silly question! Thanks for your lovely blog i think it is great! Hi Alyssa, I do actually weigh the evaporated milk. I’m not sure what the measurement is in mililitres, but try 94ml, as onlineconversion.com suggests, and if your Biscoff spread looks to dry, or too thick, add just a little bit more milk. This particular recipe should work well if you double or halve it. Great recipe! I discovered the prepackaged cookie butter in the international section at my local grocer here in the USA. Having an 11 year old with a severe peanut allergy is tough, because he can’t stop in before practice and grab a quick peanut butter and jelly sandwich for some carbs and protein before he hits the field. Now we’ve discovered nut free butter that isn’t as healthy, but is tasty and fast and holds him over until dinner, especially with banana coins or jam. Thanks for the blog. I love it. I’m going to try Cocada Butter and Ginger Snap spread next! Can we use it straight after making it ? Think this could be used in baking in place of the store-bought? For recipes like cake or fudge? I’m not sure, Rebecca. I haven’t yet tried it in any baking recipes. May work for fudge or ice cream or beverages, but not sure about using it in cake or cookies. If you do decide to try it out, please let me know how it went! Omg I made it and it’s so so good!! The idea of adding lemon juice didn’t really appeal to me… So I gave it a miss but, seriously I had no hopes that home made biscoff spread would taste anything like this!! It’s pretty close to the store bought version… Loved it! We had them with hot toasted croissants!! Perfect balance of crispy and smooth!! I wonder if using dulce de leche in place of the milk would add to the flavour, or maybe take over? As real speculaas biscuts are available in every Coles and Woolies that I have seen, you should just point people towards there, rather then trying to import or find an American version. Go for the original! Woollies doesn’t sell them and never have I’ve been looking for these biscuits for ages and you can only buy them at Coles. 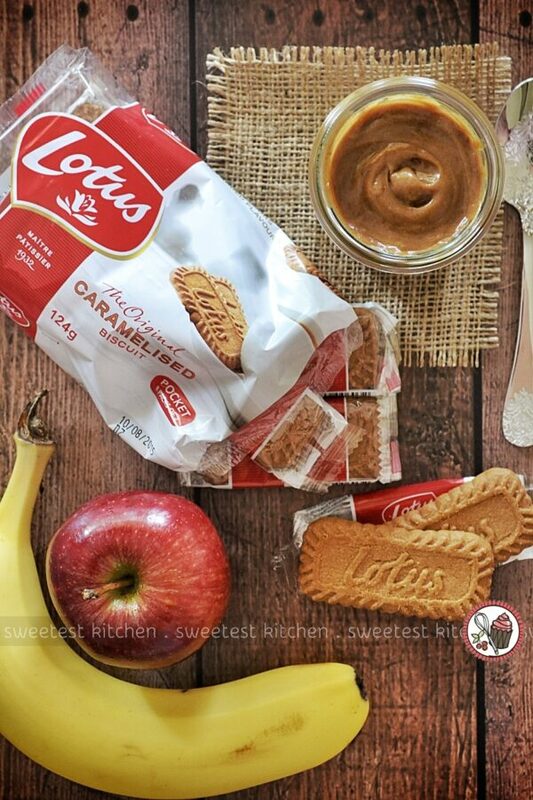 I just bought he Lotus biscoff cookies from woollies last week and at Coles yesterday. Just in the biscuit section. And it’s the Biscoff brand not Speculoos although they are much the same, caramelised biscuits. Actually on further research it is the same, Biscoff is just a brand name given for the same thing. Perhaps Speculoos didn’t have quite the same ring as Biscoff. It irritates me when people don’t do the research before commenting. The Biscoff spread is still made from the Speculoos Belgium cookie. Only the name is different not the product. I have been to Belgium and have bought the spread made famous from their prize recipe and I have also bought the Biscoff brand. To avoid confusion, the taste is exactly the same. Thankyou posting this recipe. It’s absolutely Devine.